I call it the fun run weekend, as the fun & comradeship we have is second to none. Turn – out from the members with the help & exhibits was great. 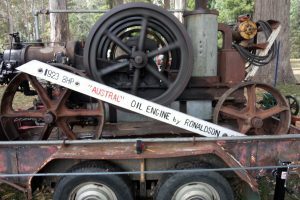 Lloyd Tunbridge – Furphy Farm cart, Lister engine, L.A. International engine. 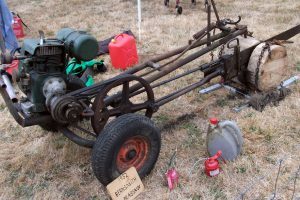 Kevin Reeve – Bern Smith Drag saw and other memorabilia. John Booth – 1902 – 1961 McCulloch chain saws, 1952 Bern Smith Drag saw, Ronaldson Tippett Drag saw. Fred Harris – McDonald SPI 4 H.P. 1957 engine driving Twin cylinder Water Pump. 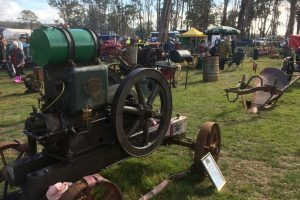 Lister D 1920 engine driving Ajax 1 1/2 Water Pump 1941, Lister diesel engine driving IBC Pump 1941, Lister A engine driving Ajax D Pump 1940. 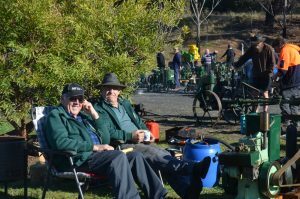 The Sassafras Heritage Farming Weekend along with our club The Historical Machinery Club of Tasmania would like to thank those members who exhibited and helped over the weekend. It was good also to see some of our north east and southern members in attendance. Those who exhibited had a good time and the members who did not come, well all I can say is you missed out on a great weekend. What a line up. Our members did us proud. It was great to see full compounds. Once again southern clubs were in attendance and the camaraderie between the clubs was evident. There was a continuous stream of people filing past looking and asking questions. Never a dull moment at Agfest. Watching our two young members (Alex & Duncan Mantje) it is evident that they know what they are doing and they will surely go on to be valuable members of our club. The day started out a bit cloudy & cool, by early morning the clouds cleared & we had a perfect autumn day. 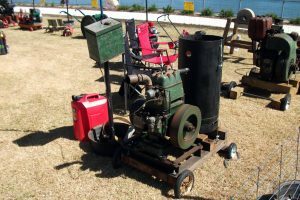 Neil Broomhall: Ronaldson Tippett engine, model N.A. 23/4 H.P. ; Cooper 4 stroke 900 R.P.M. model xc 3H.P. R V Cooper Motor 1 H.P. driving Pump. February 10th and 11th 2018. A great day was had by all. We had a good display that was well appreciated by everyone. Present were, Judy and David Burk, Nigel Boyd, John Booth, Fred Harris, Neil Broomhall and Lloyd Tunbridge. Judy and David had their Farmall Cub and Moffitt Virtue motor on display . Lloyd had on show water cooled Sundial and International motors. Fred Harris had three lister diesels complete with water pumps all with new first class signage . We had a great display with a lot of local and some interstate interest and even the weather held off apart from a few spits . 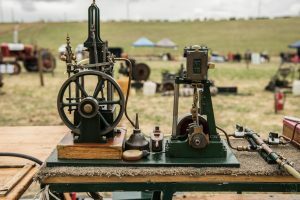 On the 10th of Febuary a small group of members headed west to the Waratah Chopping Carnival. Present were Ray Harris displaying a large diesel motor utilising a old milk churn as a water hopper (sorry Ray I forget the name of the motor). Viv and Elaine Voss displayed their blowfly and pump. Rick Diprose presented a mixed ute load of handtools, picks, fernhooks etc. Derrel and Karyn Haines had their David Brown tractor there. 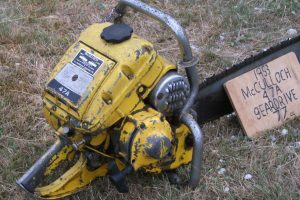 John Booth had a collection of Mccullock chainsaws and a Mobilco swingsaw ( I tried to get Rick to demo the swingsaw with no luck). Quite a bit of interest in our display, at least the rain held of till we had packed up .